There was no way my wife could find out about it. She'd never suspect a thing. I'd be able to do it without her getting the slightest inkling. Her church choir would practice for their Christmas special music for at least four hours. That would occupy her all evening, and I would be alone in the house -- supposedly innocently watching tv. Also, both the boys planned to spend the night at Stevie's house after their Boy Scout meeting. No one in the family would know for sure where I was or what I'd be doing. I would be free to pursue my plan in secrecy. Even before she left, I casually began to get things ready. Under the pretense of fixing myself a snack, I checked the silverware drawer. The spoons were there in the back. Solid silver. Antique flatware, an inheritance from my wife's aunt. We seldom used them. They'd never be missed. And the old cast iron pot we used in summer camping rested uselessly in the cabinet under the oven. It also was expendable. As I banged around in the kitchen, I practiced not looking guilty. I feared my expression might give me away. But I succeeded in appearing innocent; she rushed off to church never suspecting a thing. The tin snips weren't in my tool box! I nearly panicked. Where were they? Would scissors do? I rummaged around getting out the charcoal and a can of fire starter. Then I remembered seeing Freddy using the tin snips for some Boy Scout project. I dashed up to his room. Lord, what a mess! He had cached the snips and a spool of wire in a tennis shoe under his bed. Thank God I stumbled onto them. I threw open the den window for ventilation, pyramided the charcoal in the grill, soused the briquettes with starter fluid and lit the fire. I ran back to the utility closet and pulled down a fan from the shelf. Plugged it into the hall socket and positioned it so the flow of air pushed the smoke back toward the den and mostly out the window. Good. Back to the kitchen. How many spoons would I need? The silver looked thin. Three ought to do; better make it four. Using the tin snips, I cut the spoons into small chunks -- silver is tougher than it looks -- and I dumped the chunks into the iron pan and set it on the grill in the den. Now for the plaster. There wasn't any plaster. I was sure I had a box somewhere. Last time I saw it was... Halloween! Just before Halloween, Johnny had been making a plaster statue of Frankenstein's monster. I dashed up to his room. The only thing to do was to jog down to the 7-11. I had to have that plaster of Paris. I checked my fire and started sloshing through the rain. They had one box left on the shelf. If only I could get it home without it getting wet. I should have driven her to church, then I'd have the car. When I got back, the iron pot was red hot and the little silver giblets had turned black; but they weren't any softer. I added more charcoal. Dropped some on the living room rug... Clean it up later. I mixed the plaster over the kitchen sink and poured it into a shallow aluminum pie pan. While it stiffened, I went to my desk to get the arrowhead. Actually, I think it was a spear point; it's too long to fit on an arrow. When I was a teenager, I found it underwater while diving in Ichetucknee Springs, Florida. Some Paleo-Indian chipped this flint into shape long before the Spaniards landed. A flawless stone blade, primitive and lethal, yet possessing the balanced symmetry of perfection. It looks as "right" as an egg, or a feather, or a sand-dollar. I kept it nested in white cotton in an old watch case in my bottom drawer. Such care seemed incongruous for it remained keen-edged after maybe 10,000 years on the river bottom. Once, perhaps, it had been embedded in the hide of a mastodon or saber-toothed tiger; now, I was going to cast its exact proportional shape in silver as a Christmas present for my wife. Envision it, an elegant slender taper of silver on a delicate silver chain against the deep royal blue of her best dress. Such simple perfection. Such loveliness. Besides that, it wouldn't cost anything. Having bought the boys a road-racing set at a price which would dent Rockefeller's budget (also two pair of skates, two BB guns, and a puppy, still to be picked up at the kennel), I was near broke. So the silver arrowhead represented a gift which would be beautiful, meaningful, valuable (the price of silver being what it is) -- and cheap. Only my silver wouldn't melt. It seemed no softer than when I'd cut it. I tried to remember how my father melted metal in the foundry... a Blast Furnace! Much hotter than a regular fire. What a brilliant idea. Taking the canister vacuum cleaner out of the closet, I fastened the hose at the exhaust outlet so the vacuum blew instead of sucked. I threaded the flexible hose through the lattice back of a chair and aimed the nozzle directly into the bed of coals. What heat. That should do the trick. Back in the kitchen, I buttered my precious arrowhead so plaster wouldn't stick to it and pressed it into the pie pan. After a bit, I lifted it free and there was its exact impression. I felt inordinately pleased with myself. 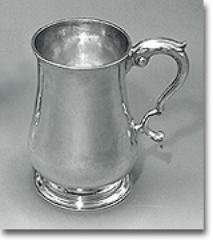 Paul Revere, move over; another skilled silversmith is in the making. The pungent stink of burning interrupted my self congratulations. I dashed into the den. The jet of forced air from the vacuum blew the grill's heat laterally against the door to my den. Its paint blistered. The door smoldered. But the silver in the pot was beginning to puddle. I refused to stop this close to success. Rushing to the yard, I tripped over a sprawled bicycle -- last Christmas'. "Never buy 'em another present," I muttered groping for the garden hose. I poked a hole in the den's screen window, shoved the hose through and twisted the spigot full blast. Dashed inside and tried to capture the end of the hose which thrashed around like a wounded octopus. Caught it. Soaked the door enough to stop its smoking. Let the hose go again and dashed out to jerk the flailing thing back outside. Scrambled inside. Thank God, the silver was liquid. But the hose had wet my fire. I rushed the molten but cooling liquid to the kitchen and poured it into my plaster mold. Good Lord! I forgot the eye for the chain in back. Quick. Before the metal hardens. I sagged against the kitchen counter, breathing. I ran a little cold water in the pie pan, then cracked the mold open. The silver arrowhead came out exactly as I envisioned it -- only more beautiful. The fire still blazed in the grill. The vacuum roared. The door smoked. The hose gushed in spastic arches on the lawn. And the front door burst open. Freddy and Johnny rushed in. "Dad. Dad," they yelled, "We saw smoke from Stevie's house. What's wrong? What happened?" "Calm down, Boys," I said. "I want you to help me clean up this mess and swear to keep it a secret. Nothing's wrong. I'm just making your mother a necklace for Christmas."